For sound empirical reasons the consensus science of 1400 years had been that the Earth is stationary at the bottom of the world and the Church Fathers anciently interpreted Scripture in the light of this settled science. In the early 1600s, a series of telescopic discoveries made nearly simultaneously by Harriot, the Fabricii, Marius, Galileo, Scheiner, Lembo, et al., had broken Ptolemaic astronomy beyond repair. But falsifying Ptolemy does not affirm Copernicus. The Tychonic model seemed the best alternative at the time. After all, if a geomobile theory were factual, it would require an entirely new physics, and no one had one handy. One discovery -- the sunspots -- triggered a flamewar of epic proportions between Fr. Christoph Scheiner SJ, a mathematician in Ingolstadt, and Galileo Galilei, a mathematician-courtier of the Florentine Grand Duke. This will have Dire Consequences later. Die-hard Aristotelian Lodovico delle Colombe attacks the new discoveries in a paper, some philosophers refuse to look through a telescope, some look but see nothing. (*) Galileo ignores or mocks them. Then della Colombe's "Liga" engineers a series of attacks, first by Lorini, then more scandalously by Caccini, finally by a formal complaint filed by Lorini with the Holy Office. The Office dismisses the complaint without prejudice. (*) see nothing. With good reason. The first telescopes did not produce great images. (*) Caccini. After Tommaso's infamous sermon, his brother Matteo, who lived in Rome, wrote him in outrage (2 Jan 1615), telling him "you have behaved like a dreadful fool." The text of the letter is here. Caccini had come Rome because his brother Matt wangled him a Resident Bachelor of Arts at the Minerva as a way of dragging him away from Florence and his involvement with those "nasty pigeons" (i.e., Della Colombe's Liga.) Matt wrote their older brother Alex in January that Tom is "lighter than a leaf and emptier than a pumpkin" and that he has "ways to have him removed out of Italy ifnecessary." Degrees of Kevin Bacon: The elder Caccini brother, Allesandro, had made his early career in the banking interests controlled by Fillipo Salviati, Galileo's BFF and sponsor who will play one of the roles in the Dialogue. In Rome, he had gone into horticulture and helped shape the Villa Borghese park. 21 Mar. 1615. Cardinal Piero Dini (44) and Giovanni Ciampoli (26) write to Galileo telling him that they have sussed out the Zeitgeist and found no great moves afoot, only the usual rumors one finds in Rome at any time. Cardinals Maffeo Barberini (47) and Francisco del Monte likewise send assurances through them, as does the sympathetic Fr. Luigi Maraffi, Preacher-General of the Dominicans. (*) Caccini has come to Rome only for a baccalaureate of his. (*) The Tuscan clan. All these men, plus Bellarmino and Galileo, are Tuscans, owing political allegiance to the Grand Duke. At this point only Bellarmino knows that Caccini has filed a complaint, and it is not yet on the docket. Nothing may come of it. (The interrogatories will not be finished until November.) So no one is being coy. The Office operates in strict confidentiality. But there is an undercurrent of anti-Tuscan prejudice among the Romans in the Curia. We think they are all Italians. They did not. 23 Mar. 1615. Galileo has heard that Copenicanism might be ruled as acceptable as a simple mathematical system. This might please the mathematicians, but not Galileo. He sends a spiritual defense of his views to Dini, rejecting the notion that the Copernican model is "just math." 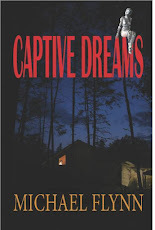 He includes an authentic copy of Letter to Castelli, but as it was written in haste, he adds that he is working on an expanded version as Dini has urged him to. Copernicanism must be accepted outright (despite no convincing demonstration being yet available!) or rejected outright. This is a dangerous line to draw in the sand, since the empirical evidence is against Copernicanism at this point, and the model is in fact wrong. (*) Ciampoli warns him that "not everyone has the dispassionate faculty... one man amplifies, the next one alters, and what came from the author's own mouth becomes so transformed in spreading that he will no longer recognize it as his own." Dini and Ciampoli do not show this letter around and advise Galileo not to test the enemy's fortifications when no war has yet been declared. But Galileo is no pacifist. (*) the model is in fact wrong. Recall that the Copernican model had more epicycles than the Ptolemaic one, that (for mystical reasons) the planets moved in perfect Platonic circles, and that the centers of these orbs were not actually the Sun but the center of the Earth's orbit. A viable scientific theory is not just a fluffy-bunnies-and-rainbows notion.You could flip a coin and get a mobile Earth! The model. Notice how much simpler the Copernican model is. Not! Nor did it provide notably superior predictions for horoscopes and calendar-making, which were the two reasons for astronomical mathematics. 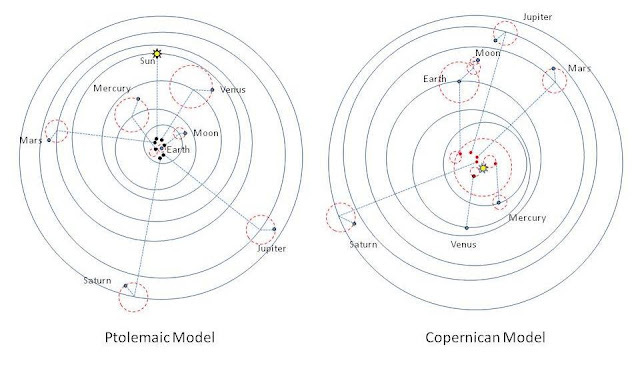 The centers of planetary orbits in the Copernican model are indicated by the red dots. Notice that they are a) not all the same, b) not actually at the sun and c) some of them move on their very own epicycles! 2 Apr. 1615. The Holy Office tells the Florentine Inquisitor -- what today is called an "investigating magistrate" (Continental law) or a "district attorney/prosecutor" (in the US) -- to interview the witnesses Caccini tagged. The Florentine Inquisitor shows no great hurry for doing so. Ximenes is traveling and cannot be located. And who is this Attavanti? Notice: "may not depart from the Scriptures as explained by the holy Fathers" not "may not depart from the Scriptures as literal." Bellarmino was aware that no text is self-explanatory; it must be interpreted. The Fathers had read things in the light of the rock-solid consensus science. If anyone ever comes up with, like, you know, empirical proof? that the Earth moves, then we'll take another look at how to understand those passages. Meanwhile, let's not be hasty either to approve or condemn. Bellarmino does not know Copernicus. Very few people in Europe have actually read Copernicus! (Even many of those who champion geomobility do so more in reaction to what they see as hidebound Aristotelianism.) But Bellarmino does not dismiss him as "that fool" as Luther had done. It seems strange to our modern obsessions, but Bellarmino (and others) did not regard astronomical mathematics as the single most important thing in life. TOF pauses at this point on what is to Modern eyes a fascinating and paradoxical irony. In his Letter to Foscarini, Bellarmino shows himself to understand scientific proof better than Galileo. In his Letter to Castelli, Galileo shows himself to understand exegesis better than Bellarmino. Go figure. Galileo agrees that Scripture is inspired and that there cannot be two truths. He doesn't want the Church to back herself into a corner on a matter of astronomy. But for his friends Bellarmino and Cardinal Maffeo Barberini (47) of the Congregation of the Index the question of truth does not arise in the case of astronomical models because they are simply tools for calculation. Galileo OTOH believes the Earth really does move. If he'd had proof of this, all would have been well. But he does not, and he never will. TOF pauses once more to note that the real Scientific Revolution in astronomy was to move astronomy from a branch of mathematics to a branch of physics. Galileo intuited from his study of the Moon that the heavenly bodies were physical places much like Earth, about which physical discoveries could be made. Some other telescopists have been reaching the same conclusion, but to most folks the old instrumentalist approach remains the default, and cosmological models (whether Ptolemy, Copernicus, or Tycho) remain merely calculation devices. Hence, the Lutheran Andy Osiander's well-meant preface to Copernicus' book. Sidelines. Kepler is distracted from astronomy by the fact that his old battle-axe of a mother has been accused of witchcraft! May 1615. In early May, Foscarini leaves Rome, having befriended Cdl. Giovanni Millini, Secretary of the Holy Office. Galileo's correspondence for the next several months is lost. Mathematics applies only to the static and accomplished -- such as a quartz crystal. But the natural world is in constant motion and mathematics does not apply to change. (Remember: there is no calculus yet. Only arithmetic and geometry. Even Newton will carefully structure his Principia in correct Aristotelian form -- with axioms, Euclidean geometry, and deductive logic -- to ensure that is true scientia. What seems obvious in hindsight never is in situ. OK, the Florentine inquisitor has now had enough time to track down Ximenes and call him in for testimony. (Think 'grand jury' without the jury.) Let's get back to the action. The testimony is sent to Rome, where it is reviewed and... dismissed as an obvious set-up job. Attavanti is a dupe being used by Caccini and Ximenes. Better luck next time, Pigeon Leaguers! TOF notices that when Attavanti mentions the motion of the earth, the Inquisitor passes over it and asks the important stuff: what about the theology? Under the rules of the Inquisition, a charge must be confirmed by two independent witnesses, but things that Caccini said were not repeated by Ximenes, and Ximenes had brought up points not charged by Caccini; so the Inquisitor drops them and asks Attavanti only about God being an accident (versus essence) and about God being sensitive, the only two specifications made by both Caccini and Ximenes. No one brings up the motion of the earth except Attavanti in passing. Because the proceedings are secret, Galileo never knows that he has been denounced and the charges dismissed. 25 Nov. 1615. A notation on the file reads: "See the Letter on the Sunspots by the said Galileo." Hmmm. Maybe things are not yet quite settled. Curiosity has been aroused. 28 Nov. 1615. As a courtier, Galileo is not allowed to leave Florence without the Grand Duke's permission; but having gotten wind of something brewing, Galileo asks for and receives permission to go to Rome and defend his reputation. 5 Dec. 1615. The Tuscan ambassador in Rome worries. "I do not know if (Galileo) has changed his theories or his disposition" but certain Dominicans are ill-disposed and "this is no place to come and argue about the moon." 10 Dec. 1615 -- 20 Feb. 1616. Galileo arrives in Rome for the third time and dives into a round of parties and receptions -- at which his savage wit excels. His enemies had spread rumors that he was in disgrace in Florence, but here he comes with the Grand Duke's blessing and staying in the Villa Medici "with board for himself, a secretary, a valet, and a mule." The mule, TOF supposes, had separate quarters. But persuading friends at social gatherings is a far cry from persuading the powers-that-be. It's like a politician with a fawning press. It is too easy to grow more confident than circumstances warrant. Shea and Artigas add: "Galileo’s eloquence and his brilliant repartees made for great sport in the literary circles to which he was repeatedly invited, but the applause that he won had little to do with a genuine understanding of the nature of the argument. Most people enjoyed the liveliness of the discussion but treated the whole matter as a suitable topic for a debating society rather than a serious scientific enquiry." Galileo thought he was making great progress, but he was only being entertaining at parties. The upshot is that he began to Attract Attention. "The Sun is at the center of the world and hence immovable of local motion." 22 Feb. 1616. Tom Caccini pays a visit on Galileo and makes fulsome apologies for his sermon but impresses Galileo as "a mind full of venom." It is possible that he was told by the Inquisition to go apologize over the imputation of grievous heresy and blasphemy concerning the nature of God. And maybe to find out if he still holds that Copernican nonsense. The notion that the Sun is at the center of the world and at rest is "foolish and absurd in philosophy, and formally heretical, inasmuch as it expressly contradicts the doctrine of the Holy Scripture in many passages, both in their literal meaning and according to the general interpretation of the Fathers and Doctors"
The statement that that the Earth moves "deserves the same censure in philosophy and, as regards theological truth, is at least erroneous in faith." Reminder: The main reasons why the motions of the Earth are "absurd in philosophy" is that if the Earth revolves around the Sun there would be visible stellar parallax, and if the Earth rotated on its axis there would be Coriolis effects. There were none, thus falsifying the theory that the Earth moves. (There were also other reasons that seemed important because no one had formulated a theory of inertia and so forth.) We can hardly blame the theologians for taking the word of the natural philosophers any more than we could blame the lawyers in the Dover case for taking the word of the biologists. 25 Feb. 1616. But no board of theologians, even those basing their ruling on Settled Science™, can declare a heresy, even a formal heresy (i.e., heretical in form). Lord Cardinal Mellini notifies the Reverend Fathers, the Assessor, and the Commissary of the Holy Office that the censure of the Qualifiers has been reported, and His Holiness [Paul V] directs Lord Cardinal Bellarmino to summon before him the said Galileo and inform him of the decree. If he resists, Galileo is to be presented with an injunction that includes imprisonment. Pope Paul V is inclined to declare the hypothesis as contrary to faith, "but the Cardinals Caetani and Maffeo Barbarini withstood the Pope openly and and checked him with the good reasons they gave. The decree makes a careful distinction between a mathematical hypothesis and a physical fact and it is only the latter that is to be avoided. 26 Feb. 1616. Galileo is called in by Cardinal Bellarmino and, in the presence of Michelangelo Segizi O.P., Commissary-General of the Holy Office and two guests, is given a heads-up regarding the forthcoming decree and warned of the error of his opinion. And immediately thereafter, the Commissary jumps in with the injunction and tells him "to relinquish altogether the theory that the Sun is at the center of the world and at rest and that the Earth moves; nor henceforth to hold, teach, or defend it in any way whatsoever, verbally or in writing." Otherwise proceedings would be taken against him by the Holy Office. Galileo acquiesces and promises to obey. Something is wrong. The injunction was to be delivered only if Galileo rebuffed Bellarmino, whose notification was necessary and sufficient juridical action. Commissary Segizi jumped the gun. There are no legal grounds for the personal prohibition against holding "in any manner." The decree allows for the discussion of Copernicanism as a mathematical hypothesis, since Copernicus' book is only to be corrected and not removed altogether. The decree does not mention Galileo personally, and some pains have been taken to keep him out of it. This is a private meeting in advance of a public ruling of the Index, done as a courtesy to Galileo so that he will not be taken by surprise next week. 5 Mar. 1616. The decree of the Index is published. Castelli, friends in Venice, and elsewhere *facepalm or even *headdesk. Fortunately, Copernicanism, while it cannot be taught now as established fact, can still be discussed as a mathematical model. And Bellarmino has stated that if empirical proof is ever made that geomobility really is physical fact, the cognizant bodies can revisit the interpretive issues in the light of new knowledge rather than "say that something was false which has been demonstrated." 6 Mar. 1616. Galileo writes to Curzio Picchena, the Tuscan Secretary of State, saying that he had not written the week before because nothing had happened. 11 Mar. 1616. Galileo is given a private audience with Pope Paul V and for three-quarters of an hour he and the Pope stroll about the gardens. When Galileo mentions the actions of his enemies, the Pope assures him that he “could feel safe,” for he was held in such esteem by himself and the whole Congregation that they would not listen to these calumnies. Paul V Borghese is an authoritarian martinet, a literal, rigid mind, and a man "so averse to anything intellectual that everyone has to play dense and ignorant to be in his favor." He would never have shown Galileo such favor if the mathematician had been under an injunction by the Holy Office. Galileo stays on in Rome because he doesn't want it to look as if he had been whupped out of town. Cardinal Del Monte writes to the Grand Duke that "Galileo has come out of this in excellent position," and he wants His Highness to know because Galileo's enemies "will not desist from their machinations." Cesi writes of the Pigeon League, "Let them bark in vain." Galileo himself writes in great confidence, not as one in terror of the Inquisition or as one enjoined from ever mentioning Copernicanism in any way. Also he has learned by now from his well-connected friend G.F. Buonamici* that his own Letter to the Grand Duchess, the expanded version of his Letter to Castelli, has been a factor in the last minute compromise by which his BFF Barberini forestalled the Pope from an ill-considered action! (*) friend G.F. Buonamici. Since buonamici means "good friend," the Higher Critics of a future era will undoubtedly claim that he is a fictional contruct introduced into the legend. Yet we have his diary. Go figure. 20 Apr. 1616. Rumors are circulating that he had been summoned to Rome and charged with heresy. Castelli writes from Pisa of stories that he had secretly abjured his errors before Cardinal Bellarmino. Three days later, his friend Giovanfrancesco Sagredo reports that the same gossip had rumbled through Venice. We, Robert Cardinal Bellarmino, having heard that it is calumniously reported that Signor Galileo Galilei has in our hand abjured and has also been punished with salutary penance, and being requested to state the truth as to this, declare that the said Galileo has not abjured, either in our hand, or the hand of any other person here in Rome, or anywhere else so far as we know, any opinion or doctrine held by him. Neither has any salutary penance been imposed on him; but that only the declaration made by the Holy Father and published by the Sacred Congregation of the Index was notified to him, which says that the doctrine attributed to Copernicus that the Earth moves around the Sun and that the Sun is stationary at the centre of the world and does not move from east to west, is contrary to the Holy Scriptures, and therefore cannot be defended or held. In witness whereof we have written and subscribed the present document with our own hand this twenty-sixth day of May 1616. Galileo returns to Florence figuring he has come off pretty well. With Bellarmino's memo in his pocket, he holds himself free, like anyone else, to discuss Copernicanism as a mathematical model and awaits the revised edition of Copernicus as an approved textbook. The corrections required are few and minor; simply a matter of not asserting physical fact as proven. All he has to do now is whump up a book that will demonstrate with certainty the physical reality of the Earth’s dual motion. Then he hit a snag. He didn’t have such a demonstration. Christie, Thony (2012) What to do if your mother's a witch. Christie, Thony (2013) Getting the measure of the earth. Shea, William R. & Mariano Artigas. The Galileo Affair. A short summary of #11, with slides. Any plans to link these internally so one can start with I and move forward? So far I for one only see I to II. Too bad. I've put backlinks in most of the "Previously on the Smackdown" intros, and have now added links to the next episode at the end of each under some variant of "to be continued"
Oh, I see them now. My lazy students will thank you. Er...probably not. But I thank you for them. The lazy student in me(remaining undigested in the instructor I am now) certainly thanks you, Mr. Flynn! I'm really grateful someone with your storytelling skill has written this summary. Against however Shea and Aritgas' damnation of Galileo by faint praise, he was supported in his early years by none other than Clavius, the very father of the Roman College's top-drawer mathematics department. So there was obviously something there that people like Clavius thought worth cultivating. Michael, what you've got here is the skeleton of a very good book. Maybe you should write up a proposal and start shopping it around to publishers. Nah, it's the skeleton of three good books, listed in the references at the end. "Since buonamici means "good friend," the Higher Critics of a future era will undoubtedly claim that he is a fictional contruct introduced into the legend. Yet we have his diary. Go figure." Don't be bad-mouthing the higher critics of the future. If Higher Criticism still prevails as the intellectual fad of the literary elites in the future you hypothesize, there will be none of the higher critics well-educated enough to comprehend Renaissance Italian. You have reason to be grateful that sins are forgiven. Don't know whether it belongs here...but I just had reason to remember that the scientific evidence supporting the Earth rotating wasn't really solid in Galileo's time. Today, Google had a doodle related Leon Foucault on its front page. And I remembered that he was famous for his pendulum...A little research produced some references to Vencenzo Viviani constructing a similar pendulum in 1661, though Foucault's became very well known in 1851. Foucault's pendulum was the first non-astronomical evidence for a rotationary Earth. Viviani apparently studied the same effect in 1661, though his research wasn't as well known. Probably because he didn't do a large public exhibition at the opening of a well-known building in Paris. As an interesting connection to Galileo, Viviani studied under Galileo and edited some of his work for posthumous publication. But if the rotating-pendulum experiment was done in 1661, then Galileo wasn't alive to see it. One more piece of evidence that the full picture of the Earth's motion wasn't proved by Galileo. Though I must say, his work on pendulums influenced Viviani's study of them. The first empirical evidence of the Earth's rotation, which will show up in the last chapter of the Smackdown, is Guglielmini's experiments with dropping balls, which showed a slight eastward deflection. These were done in the 1790s. "Reminder: The main reasons why the motions of the Earth are "absurd in philosophy" is that if the Earth revolves around the Sun there would be visible stellar parallax, and if the Earth rotated on its axis there would be Coriolis effects." What is your evidence that this was the reason? You call it a "reminder," so you may have explained it elsewhere, but I haven't read the whole series. Thanks. The lack of parallax was noted by the ancients. The lack of Coriolis was somewhat later, but was noted by Riccioli when he tallied all the arguments for and against geomobility. They were covered in Part I. Thus, the reason why it's absurd in philosophy is simply the same reason why it's formally heretical: i.e., because "it expressly contradicts the doctrine of the Holy Scripture." This makes sense, because the truths of Scripture are considered by the Church as not only the principles of the sacred sciences, but of all the sciences, since truth cannot contradict itself. On the other hand, it would make little sense for the Qualifiers to be making a judgment on a thesis in natural philosophy based on the principles of that science per se, since they could not pretend to any authoritative competence as philosophers. There is also the fact that neither the declaration of Qualifiers nor the sentence against Galileo by the Holy Office in 1633 mentions anything about their understanding of the principles of natural philosophy being among the reasons of their condemnation. Nevertheless, it's interesting to note that when certain men in the Holy Office lobbied successfully to relax the prohibition against heliocentrism in the first half of the nineteenth century, they figured, like you, that the judgment of "absurd in philosophy" was predicated of the theses of the dominant philosophy of the seventeenth century. Therefore, it would appear that my thesis is in direct conflict with theirs, which ought to give me pause, I guess. The Qualifiers didn't have to elaborate on that which was the consensus science ever since Plato and Aristotle and Archimedes. Because the Church Fathers accepted the science of their day, they read the Scriptures in that context. A millennium or so later and this is pretty much accepted as-is. In order to change the way they read the passages, they would need to know that the science the Fathers relied upon was definitely false. It is quite common for a principle to come into disrepute because it is annexed to something rejected. States' Rights was devalued in the US because it was used in defense of slavery. Copernicanism was used to justify a particular Scriptural exegesis. The authorities were reacting to the exegesis and Copernicanism was collateral damage. We will come to Settele and the early 19th century shortly. "foolish and absurd in philosophy, and formally heretical... [Why is it all those things? Because] it expressly contradicts the doctrine of the Holy Scripture...."
The plain words admit to reading it both ways, especially since the churchmen at that time would have considered anything that contradicted Holy Scripture to be ipso facto erroneous in philosophy as well. Except that philosophy and theology were kept rigorously separate. Aquinas and that crowd had held it illegitimate to support a proposition in philosophy by a resort to revelation. All one need do is refer to the natural philosophers themselves, the ones who did not have a stake in the theology game. Or for that matter those from prior eras. Aristotle thought heliocentrism foolish and absurd in philosophy -- he accused the Pythagoreans of twisting the facts to fit their theory -- and the Old Stagirite had no weenie in the Scripture game. I think that philosophy and theology were distinct, but not really separate. At any rate, I look forward to your take on upcoming events. Distinguo: In Scholastic philosophy, it was indeed illegitimate to support a proposition in philosophy by a resort to revelation; on the other hand, it was quite proper to examine a proposition in revealed religion by a resort to the methods and findings of philosophy. There was, so to speak, a semi-permeable membrane between the two disciplines, as nowadays between (say) mathematics and physics. So while Edward’s claim about the incomplete separation of philosophy and theology is valid, it doesn’t affect this particular point, and I believe Our Host’s parsing of the disputed sentence to be correct. After all, if a geomobile theory were factual, it would require an entirely new physics, and no one had one handy. Actually, Kepler had a physics for his system: see Bruce Stephenson, Kepler's Physical Astronomy. True enough, Kepler's celestial physics was wrong, based on Aristotelian ideas, and to some degree tailor-made to match his celestial kinematics. Nonetheless, as Stephenson exhaustively demonstrates, Kepler's physics guided his mathematics, and saved him on more than one occassion from crucial missteps. Also, Kepler's physics led him to predict the rotation of the sun, several years before the discovery of sunspots! To me, it is an enduring mystery why Kepler seemed to fly below everyone's radar screen. Like, they knew he was there, but they weren't really listening. Possibly because he came across like mystical loon? IIRC Galileo distrusted his 'mystical' physics. And he wrote later that when he tried to read his own book he couldn't make head or tails out of it. Galileo was the only one among them who seemed to know how to write. Between about 1630 and 1650 Kepler's Epitome Astronomiae Copernicanae (in which all three laws were clearly formulated) was probably the most widely read work on theoretical astronomy in northern and western Europe, while his Rudolphine Tables, which were based upon the first two laws, were regarded by the majority of astronomers as the most accurate planetary tables available. See also Victor E. Thoren, "Kepler's Second Law in England", The British Journal for the History of Science, 7(3) (Nov. 1974) pp. 243-258. True, Galileo showed little interest in Kepler's laws, but technical astronomy wasn't his thing anyway. Does the Dialogue even mention epicycles? It's practically all physics. Okay, but we're not up to 1630 yet. However, there's a slight inaccuracy: when you write in "1 Mar. 1616." that it's Foscarini and de Zuniga being suppressed, in fact like Copernicus de Zuniga was merely to be corrected. See for example Retrying Galileo by Finocchiaro, pp. 18.